1. Direct access to the finest small boat sailing waters in South East England. 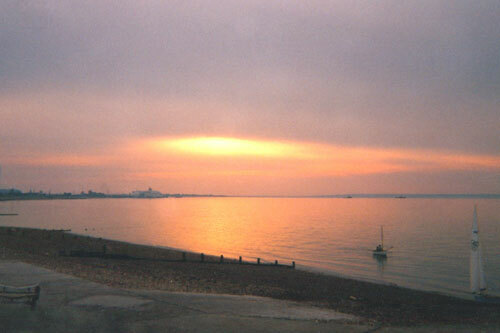 Sailing takes place in the sheltered waters of the Thames Estuary. There are over five square miles of safe, unobstructed water. Conditions are rarely too severe to prevent sailing. The Isle Of Sheppey is set to become the place to sail small boats since the opening of the second Swale road crossing in 2006. This now provides first class road access from London. The magnificent position of the clubhouse allows us to uniquely offer sheltered sea, river and estuary sailing all within 15 minutes sailing time. Launching is truly at all states of tide from a wide concrete slipway. Boats can even be driven to the waters edge if required. The club is based at the best point on the entire island for launching small boats. The difference between mean low & high water at our launching ramp is just 25 meters. The site was previously used for over 100 years as a coal depot due to the remarkably good tidal properties at this point. The diagram shows the mean low water line in relation to the club. IOS is just 30 minutes from the M25. The combination of remarkably flat water (given the prevailing wind) and huge expanse of sheltered water makes the island's north coast the perfect environment to realise the full potential of modern, high-performance asymmetrics. The estuary provides plenty of opportunity for cruising and exploring. Leysdown, Whitstable, Southend, All Hallows, Harty Ferry, the Thames, Medway and Swale are all accessible within a day. Sheerness was the first beach in Kent to be awarded the coveted European Blue Flag award for its clean beach and outstanding water quality. The sailing club's clubhouse is a substantial four-storey, purpose built building. When opened in 1966 it was described as probably the most modern yacht club in Europe. Today, it is still one of the largest clubhouses in the country. 9. Host to the UK's longest dinghy race! The annual Round the Island Race is the UK's longest at some 40 miles!